Climbers who stay there can enjoy and photograph the spectacular views of Monte Rosa in Italy. 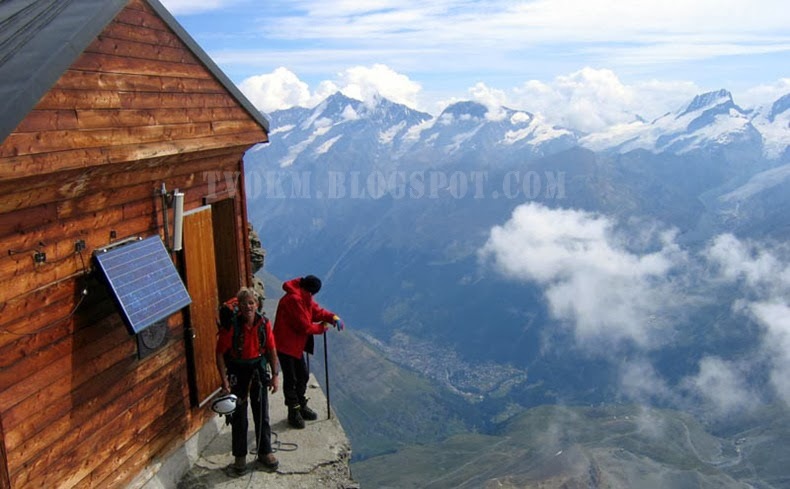 A small hut built on the northeast ridge of Mount Matterhorn in the canton of Valais district of Switzerland can be considered the most dangerous hut in the world. Given the name Solvay Hut, the hut was built at an altitude of 3,962 meters, which is almost as tall as Mount Kinabalu, at 4095.2 meters above sea level. It is also the highest structure of its kind on the continent, which is 457 meters from the top of the mountain, or two-thirds the height of the mountain. The hut is owned by a Swiss Alpine club that aims to provide shelter and food to the Matterhorn Mountain climbers. Climbers who stay there can enjoy and photograph the spectacular views of Monte Rosa in Italy. The hut, which can accommodate a total of 10 people, was built in year 1915, and took five days to complete. All the construction materials were first brought to a lower hut, known as Hornli Hut, 762 meters below Solvay hut by using animals , before carrying them on with the cable car. The structure was rebuilt in 1966, and 'pre-installed' with an emergency phone in the year 1976. Solvay Hut is named after a Belgian climber, Ernest Solvay, who contributed funds to its construction in an effort to develop the area.